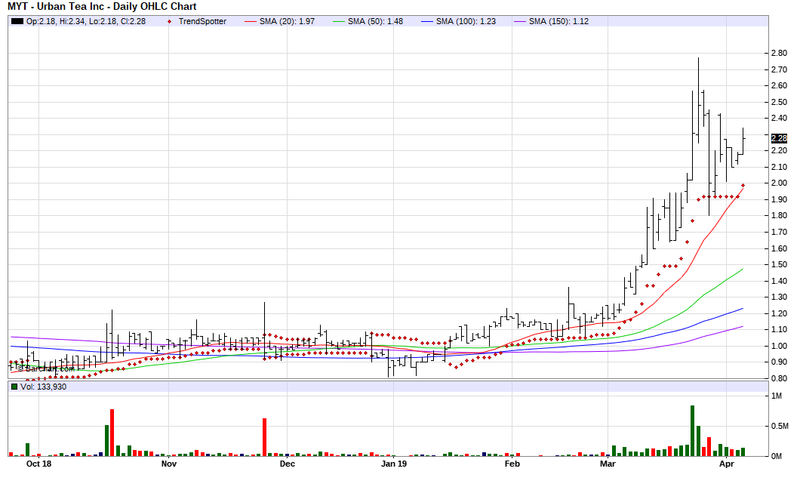 The Barchart Chart of the Day belongs to the Chinese chemical company Urban Tea (MYT). I found the stock by sorting Barchart's Top 100 Stocks first by the most frequent number of new highs in the last month, then I used the Flipchart feature to review the charts for consistent price appreciation. Since the Trend Spotter signaled a buy on 1/17 the stock gained 117.39%. Urban Tea, Inc. manufactures, distributes, and sells fine and specialty chemicals in the People’s Republic of China. It offers organic compounds, including para-chlorotoluene (PCT), ortho-chlorotoluene (OCT), and PCT/OCT downstream products. The company provides its products for automotive, pharmaceutical, agrochemical, dye and pigments, aerospace, ceramics, coating-printing, clean energy, and food additive applications. The company was formerly known as Delta Technology Holdings Limited and changed its name to Urban Tea, Inc. in February 2019. Urban Tea, Inc. was founded in 2007 and is based in Danyang, the People’s Republic of China.